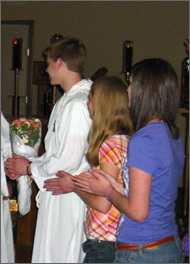 All of the young people at Church of the Holy Spirit are encouraged to consider themselves members of the parish. As members, they take part in all of the activities. Some young people are lectors in church, as well as chalice bearers, torch bearers, crucifers and acolytes. They are youth Sunday School teachers and nursery helpers. There isn't a food activity that does not have young helpers. The annual church auction counts on youth volunteers to help with check-in and check-out along side of the adults. On the Good Friday Day of Service, a youth delegation goes down to our companion parish, Cristo Rey in Trenton, to work with their young people on service activities. The special programs for young people at CHS are being coordinated by Father Phil. Watch for coming programs. 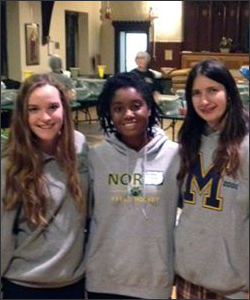 A group attended the September 2015 Lock-In for the Watchung Convocation at which the young people packaged 5000 meals! Figure out where you are. Go forward, realize that you have work to do, and believe in yourself as a hero! Practice, Practice, Practice. Pray, Pray, Pray. Listen to your heart and your gut. Do what is right and good and right and good for you! Know that you are not alone and that you have many friends, teachers, family and community members and God who want to support you and celebrate you on your journey! Remember you have a gift to give and may all of your dreams come true!